The northeastern side sea of ​​the Mediterranean between the east coast Greece and the Turkey is named after the Greek mythical figure Ägeus, king of Athens and father of the legendary hero Theseus. 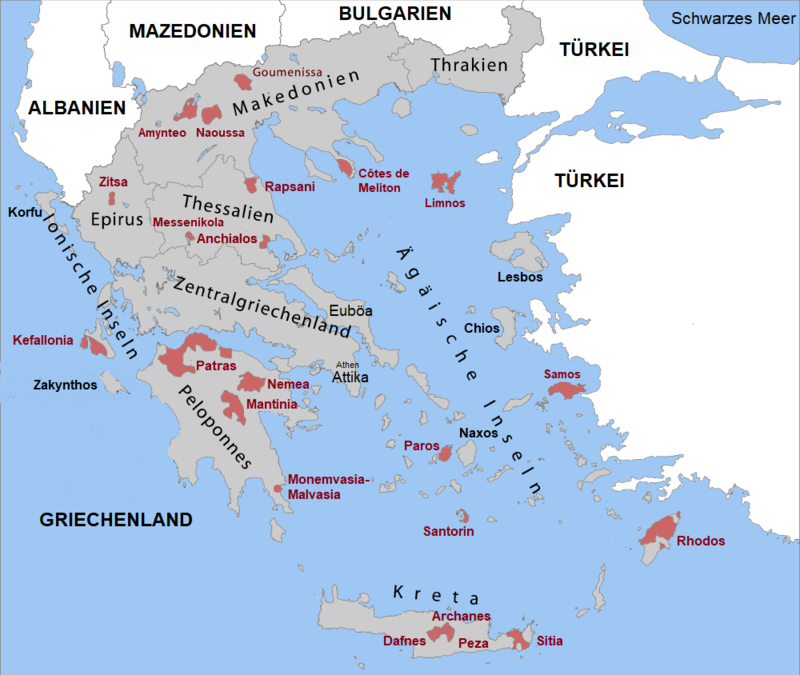 Here are innumerable islands or groups of islands such as Dodecanese, Sporades and Cyclades (Cyclades). Most of them were settled by the Greeks in 1000 BC. Viticulture and wine culture has an ancient tradition on many of these islands. Already in the antiquity Here, the best Greek wines were produced, which were delivered to Rome. On Chios (Khios) the poet died Homer (8th century BC), the island was in ancient times as the "Bordeaux of Greek wines". In the Middle Ages, especially the Sweet wines from the islands that are over the harbor Monemvasia were shipped. The most important are Crete. Lesbos. Limnos. Mykonos. Paros. Rhodes. Samos and Santorini (Image). Most possess as POP (earlier OPAP ) classified appellations. The vineyards cover about 9,000 hectares of vineyards. See also below Ionian Islands (West Coast of Greece). This page was last modified at 14 February 2018 at 15:34.